Heroes of Might and Magic V is the next installment in the venerable and long-standing Heroes of Might and Magic series. Heroes V was released in May of 2006. It is the first time in the product's history that it is being developed by a company aside from New World Computing and 3DO, the publisher. It is the Russian company, Nival Interactive has the main responsibilities for developing Heroes V and its expansions, overseen and published by the world-renowned French game developer, Ubisoft. In accordance with this new genesis of the game, Nival have also developed an entirely new universe, one that is so diverse and different that it is likened to a mythology. The highest beings of the Heroes of Might and Magic 5 universe are Dragons, who are the basis of religion, beliefs and cosmology in this new world. Each town adopts its own beliefs which are influenced by its interactions with other races throughout history. The six towns that will appear in Heroes V are the humans, Haven, the demons, Inferno, the necromancers, Necropolis, the dark elves, Dungeon, the wizards, Academy, and the elves, Sylvan, with the dark elves being the new addition to the series. The game itself will be beautifully rendered in 3D, another advancement not seen in any other previous Heroes game. It consists of at least 90 different creatures, 14 in each town. A different set of 6 magic schools live up to the name of 'Magic', while the Dynamic Combat System provides a faster option in battles. There are 6 campaigns which, in total, have over 30 missions which further explore the history behind the towns. Promising to take the genre of strategy gaming to a whole new level, Heroes of Might and Magic V has all the necessary elements of an addictive, competitive, and highly successful game. Boasting 5 different multiplayer modes, both online and offline, it is a game that can be played for hours alone, or with a host of friends, via a LAN, or over the internet in a tournament. With crisp 3D graphics, a completely new storyline, and scores of new features, Heroes of Might and Magic V is the complete fantasy game. Heroes V is being developed by Nival Interactive with some assistance from French Game Publisher Ubisoft. The current release date is scheduled for mid-late May 2006, and will follow in the same genre as its predecessors, maintaining the Turn-Based Strategy Engine in a Fantasy setting. In addition to the 30 Campaign maps, the release version includes 6 single-player maps (+3 more to download), 10 multiplayer maps (+10 to download), and a downloadable Map Editor. This box will detail small updates made to the Heroes V Section. Jun 24 07:The H5 menu has undergone a slight reshuffle due to the increasing number of articles being added to the section. Sfidanza has also added a map downloads page, where you can download and edit them in the map editor! Jun 1 07:Keep track of all the H5 TotE creatures from this page. Also, some new screenshots and concept art have been added here and here. Apr 9 07:View the new Tribes of the East Screenshots here. Sfidanza has been busy fixing some features on the creature pages, concerning descriptions and the like. If you have some feedback, post it here! You can now select a specific creature from the creature selector at the top of the page. 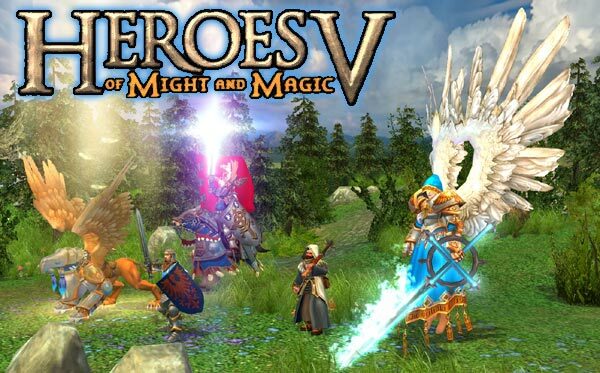 Heroes 5 Discussion Forum: the place to find walkthroughs, expert tactics and to have a chat about Heroes of Might and Magic V is Temple of Ashan Forum of Heroes Community. Join our daily Heroes 5 worship service! Heroes 5 Tournament of Honor: compete against other Heroes of Might and Magic 5 players, gain ranks and win $1000 cash! Tournament of Honor - the web's largest HOMM tournament - now open! Thanks to ThE_HyDrA and Sfidanza for the superb work on Heroes 5 section of Age of Heroes!